Jeff's ponderings: How do you read Genesis? Hang in there Bruce. Just live with it for a while. On an earlier post about light I mentioned Col 1:13 because it tells us we were rescued from the realm of darkness and brought into the kingdom of the Son (or the "light" if you want to link it to John). By the same way in Genesis that God's spirit hovered over the water (chaos, darkness, etc.) and He spoke (Who do we also call the Word? Hint: In the beginning was the Word...) into the chaos of creation and brought forth what was good. God spoke into the chaos / God sent his son Jesus into the chaos. Do you see some similarity? The stories of the earth's creation are the stories of your creation as a child of light. 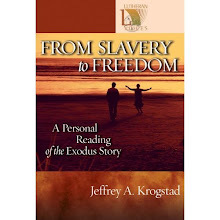 The stories of Israel's exodus into freedom is your story of exodus into freedom. See how many more parallels you can find when you look. 1) God could have created the heavens and the earth instantaneously. Yet He chose to create in a step by step approach AND within the framework of time (which was part of the creation). By doing this God demonstrates, at least to me, that their is value in process. Be it the 10 step process of plagues or the forty years in the wilderness; or the development of the fruits of the Spirit in my life or the process of Spirtual maturity as found in James chapter 1. 2) God's glory, power, and omnipotence are displayed / revealed by His creation. This is certainly a faith enourager for me. 3) God setup the foundation for His entire plan for man in Genesis. Man's downfall, need for salvation, the goodness of God, observing the Sabbath.... It is all there! Certainly, God used the process of revealing further revelation in later books and by later prophets over thousands of years, but the basic roots of all theology can be found in Genesis! Now, I still believe (by faith) that Genesis is also historically and scientifically accurate, but it enlightening to see that God had additional purposes in revealing Genesis than merely to present history!